It wasn’t a biking day, due to some conflicts so this called for some CB-QPB’s... Car Based Quick Pick Bags! I stopped near my usual stretch of 4MR and ended up filling 3 bags, picking up a VW hubcap, a pizza box and a rusty bike chain! To make it a perfect finale, @Judd came riding by as I’d finished... Happy Birthday, Judd! 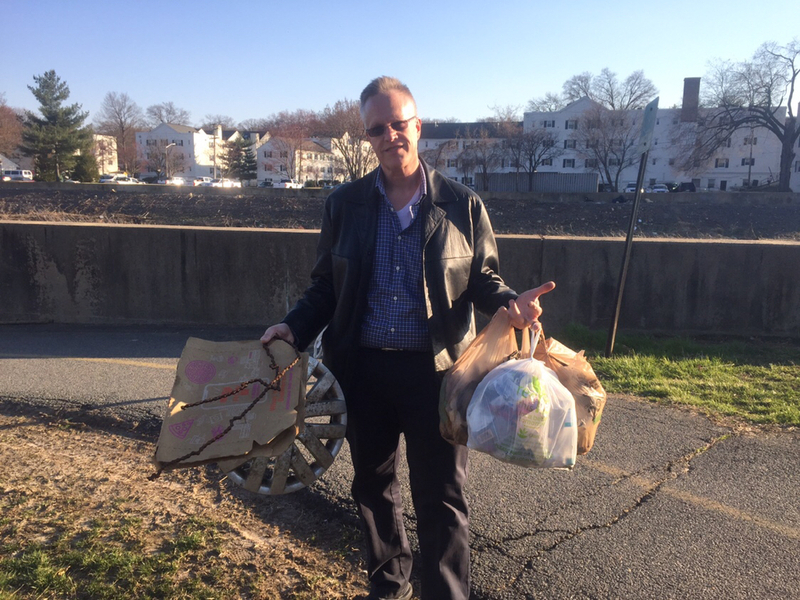 It was a very fitting end to Freezing Saddles to run in to Chris with a haul of trash on Four Mile Run. Kinda looks like I'm flippin' the bird with my left hand -- which I am -- TO THE TRASH! Yesterday, I did a little "light Lumberjacking" near the NE Branch Trail - removing branches like this one from the path between the main trail and the College Park Aviation Museum. This small effort came in handy today. I took the family on a sightseeing adventure in PG County - if by sightseeing, you'll accept a first-time trip for the missus and M through the NW Branch Trail detour on the way to Olive Garden for never-ending stuffed pasta (there've been WAY too many OG commercials on Nickelodeon lately), a first time trip for all of us on the trail alongside Wells Run (Garmin's routing did not say anything about the stairs), showing the missus the "not-quite-so"-newly opened connection for the Rhode Island Avenue Trolley Trail in Riverdale, and showing the family the aforementioned connecting trail between the College Park Aviation Museum and the NE Branch Trail (for the missus - it was a less stressful route across Campus Drive to catch the Metro heading home after the museum outing). Chris M gets two points for Diet Lumberjacking. A bonus point is awarded because the Lumberjacking involved wood. Another 10 points are awarded for taking both Mrs. CM and MM on a new trail. 13 points! As my final request for QOT points I submit this: I have to miss the freezing saddles closing happy hour so that I can become a better advocate for cyclists and pedestrians. I'll be hanging out with Bike/Walk Arlington's @Henry and Katy L that night, learning all about pedestrian safety issues. I'm hoping to use the info I learn in this course, the smart cycling class, and the LCI course that are part of the program I'm in to help me better contribute meaningfully to BPAC and the Friends of the MVT. Chris W is also attending this training with me, so she deserves all the points too. Erin gets 5 points for working on some walking and biking certifications. Chris W gets gets for points for getting her learn on too. Chris B gets two points for picking up some trash. Bonus point for running into me. Bonus point for wishing me Happy Birthday. Bonus point flipping off the trash. 5 points! Thank you to everyone who participated in the Queen of the Trail and King of the Trail competition this year. It was a lot of fun to see some of the creative ways that people cleaned up trails and carried snow shovels on bikes and the interesting things found. I hope that everyone will continue to be good stewards of the trail. Our network will only be good and continue to improve if people like you continue to care and put in the work to build and maintain it. I'm looking forward to giving away the super fun prizes tomorrow night. And thanks @reji for the marvelous quick-pick-bag idea, shared back at Valentine's Day! So simple to execute, while so positive and effective! I stole a couple of pictures from Wheels&Wings Strava of the KOT and QOT awards. Chris B with his folding trash grabber for being King of the Trail. Chris M and his riding partner with the collapsible snow shovel for coming in second in KOT points. Josephine also received a collapsible snow shovel, suitable for carrying in a bike bag. And from the Twitters: Chris W and Erin were not able to make it to closing happy hour because they were at a pedestrian safety training but I was able to arrange for the folks at Walk Arlington to award their prizes. Thanks Judd it was so cool that you arranged for us to get our prizes in front of the whole class!